Yesterday I posted about my son Zachary's new Etsy shop for mixed media art, ZackAttackArt. He's REALLY gotten into the swing of mommy's work and I decided what the heck, let me hand the little guy a hammer. I pulled out a strip of copper and a round of nickle silver and ImpressArt letter stamps from PJ Tool & Jewelry Supply the guys who have been so fantastic about sending me stamps and tools to give away here on the blog. Zack decided he wasn't just "Zack" but "Zack! ", complete with exclamation point (the new stamp sets not only have the alphabet, but include cool symbols, too). First, I gave Zack a texturing hammer. I love this hammer from Beaducation because the heads screw off and you can get nine total surfaces. Sure, I'd love a full set of Fretz hammers (I own one Fretz riveting hammer and it is a DREAM -- absolutely perfectly balanced) but for the money, this texture hammer is pretty cool. I taped the copper strip to the bench block and let Zack go to town. That's blue painter's tape, and it comes off well, even if you hammer on it. I showed him how to finish the edges of the strip with the plain rounded face of the hammer, and then I did the filing. Next, I showed Zack how to lay out his letter stamps in a row, find the center, and how to line them up on another strip of tape. 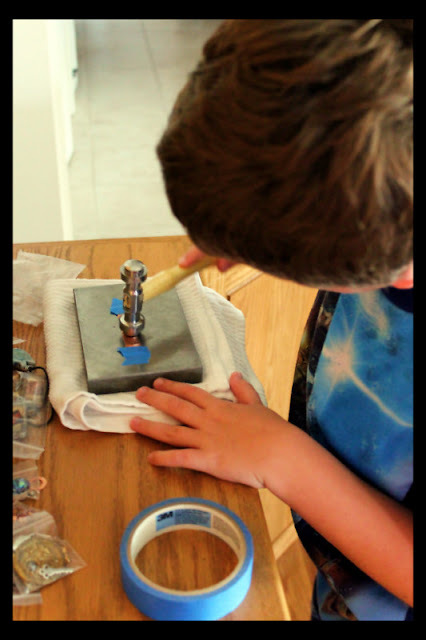 He's using the new short-handled stamping hammer from PJ Tool & Jewelry Supply. I LOVE this hammer. After stamping his name, he stamped stars below his name. After all, if your name ends in an exclamation point, you MUST have stars! Today, Zack and I sat down with a packet of rivets and beads and finished his key chain. I did all the riveting, using brass rivets and a punch I bought recently from Ornamentea. Zack chose a star charm and a red lampwork bead and I got to work. He's VERY proud of his creation. Even though I filed the edges and did the riveting, he did all the hammering and all of the design. I'm tickled pink with my kidlet. He DEFINITELY has a lot of you in him, creativity, drive, and all! Lori, that is awesome. I love his design. That is such a fun project for the two of you! Awesome, Zack. Also, awesome Zack! Awesome that he wants to be an artisan like you! Love his design! Zack - You did a great job !!! I am impressed! You are more talented than I am. I bought some supplies - worked on a few pieces and stopped. I need a lot more practice. Whoa! Amazing... you may have the next Bill Fretz on your hands here! Wow!! That kid can do some serious smithing! Does Nickle Silver oxidize easily? You both did a great job...love the way that it turned out! That is so cool! It turned out awesome! He really has an artist's eye--and the drive too! 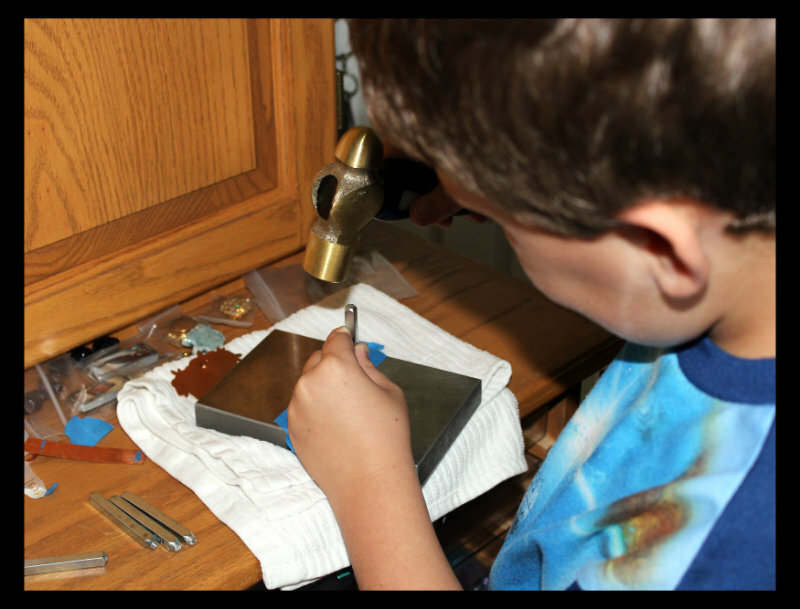 I love seeing his little hands working on the metal! Can't wait to see what else he dreams up. What a doll! Hmmm! I see a new company starting up soon: "PRETTY and HANDSOME, INC"
He should be very proud. His texture looks great. You can tell in the pictures he is hammering safely and protecting his fingers too. Way to go Zack! That boy is precious (and you're a great mom)! Also I often love creating with my 2 young boys...and they love it to. There is nothing better than a beautiful afternoon with our creative boys! They are a source of great new ideas! Wow! Well done Zack its looking great. I wish my stamping would come out looking so fine! Super nice job, Zack! Have to repeat myself here - you have such a sweet and over talented little boy, Lori! I love how you encourage his creativity. What a wonderful way to spend time with your child. I am inspired to do so with my brood. May you have many happy moments with him. Zack is definitely one of my fav designers! Great looking key chain. It's great that you are teaching Zack at a young age. I love the hammer from PJ Tools that I won from your blog. Now to get some practice in. 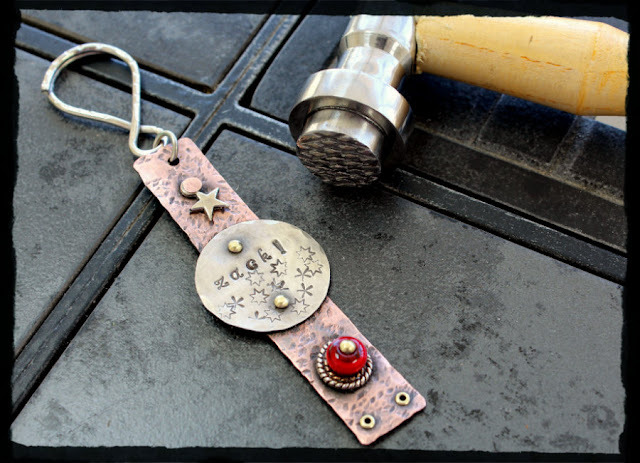 I have a question about your riveting - Did you rivet on the star charm and also the lampwork bead? Weren't you afraid the lampwork would break. I haven't tried anything in layers yet, Need to let go of the chicken. Great job Zack! Very impressive Mr. Zack! Great job! Lovely, I love it when kids want to play with you and your tools - mine does it too... 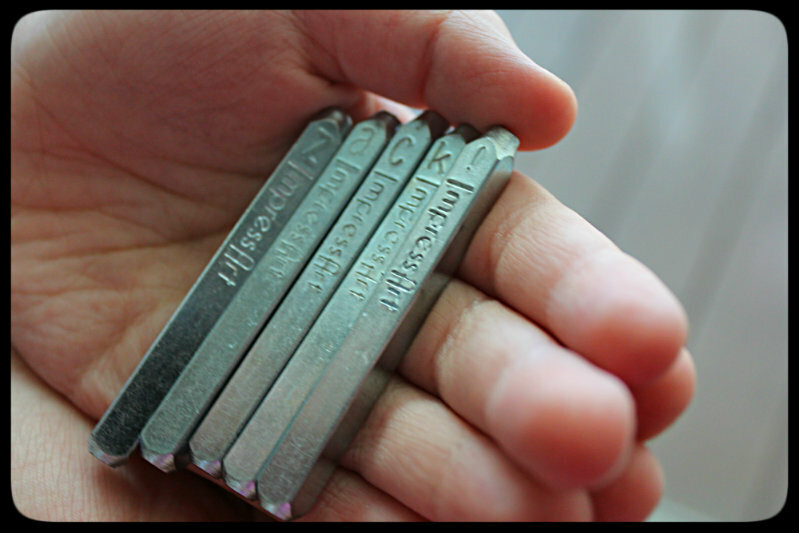 I have to get into stamping, he'd love that, I am sure. He did a great job. His design is very nice. And it's great that you can get him interested in a hobby so young and then help him learn how to follow through and do it safely. Hi, Lori. I'm new to your blog. Your son is very talented. His stamping and metal texturing are great! He's got a future in design! Awesome fun! His creation is really cool. I think I see a future mother/son business! That is awesome, great to have a studio assitant:-), I love what he is designed. I know I've said this before, but you have such an awesome kid! And he has an awesome mom -- I love that you encourage his creative side. Proud Momma!!!!! I would be! Way to go Zack - glad to see all fingers were intact at the end! - Excellent job. Breeding the next generation of artist. Brilliant!!! Yay, Zack! What fun to see his creativity unfolding! I love this! I bet he was so, so proud! He's so talented! Great work. Your little man is so darn creative. I adore that he's embraced what you do and is right in there with you crafting along. I know you are one proud Mama! Now that is just awesome! You both can be so very proud! !